On a recent trip we took our car down and rode a couple of different trips than the big one. I have added this options to the bike trail map. We unloaded our bikes at the Illawarra Sports stadium and rode along the top of the Lake to the Port Kembla Heritage Park. We had a good lunch at the café there and rode back for a total of 28km. It’s a really good ride and there are only a couple of bits on road near the beach for a few hundred meters. Apart from the scenery which is pretty good, the bonus in this ride is the start spot is only a few hundred metres from the freeway. This makes it a great spot for a ride if you are heading down the coast. Absolutely dead flat 28km with a little hill near the beach. Great for all bikes, even the trusty old clangers on the back of the trailer. Once you leave Shell Harbour heading for Kiama, you can ride through the new suburb of Shell Cove. There is a lot of building work happening near the beach so you cannot take the optimum shortcut from around Darley St. This should be fixed sometime in 2019. 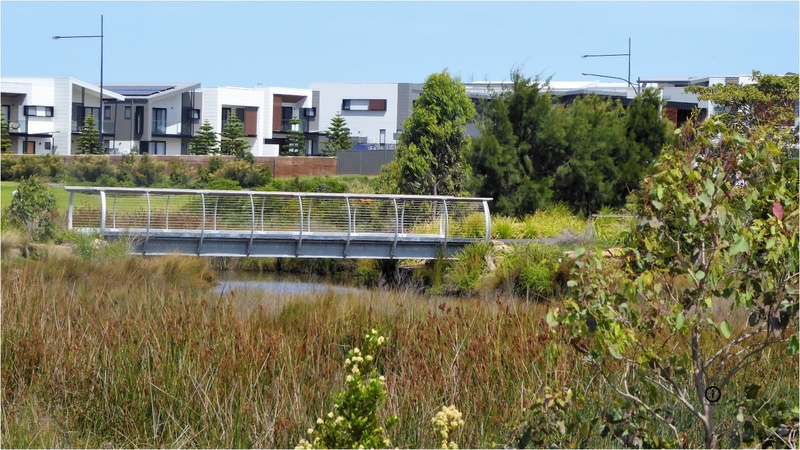 What I like about the new Shell Cove suburb is the drainage channels and the ponds. The walking and bike trails meander through these lovely features. You almost need a compass to navigate it the first time, just head in a South Westerly direction if going to Kiama (You need to end up at the corner of Dunmore Rd and Buckleys Rd). Head in a North Easterly direction if heading for Shell Harbour. A really good place to head into and you can swing around to Shell Harbour Junction station if you need to. An important thing to know is trains is this area run once an hour. That means you got to watch the clock if you are returning with the train. Minnamurra is a fun 20 minutes from Shell Cove. It’s a solid half hour ride from Minnamurra to Bombo over some good hills. Kiama is a good bit further with more gritty hills. Enjoy the pics of the Oak Flats to Kiama ride which come from a number of my rides in this area.